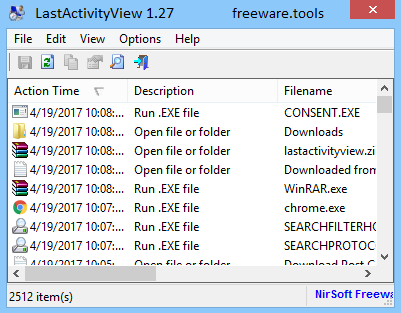 LastActivityView is a lightweight and portable software application that enables you to view the latest activity recorded by your computer, such as program installers, files and folders opened, system shutdown or user log off. LastActivityView is a tool for Windows operating system that collects information from various sources on a running system and displays a log of actions made by the user and events occurred on this computer. The activity displayed by LastActivityView includes: Running .exe file, Opening open/save dialog-box, Opening file/folder from Explorer or other software, software installation, system shutdown/start, application or system crash and more. Since installation is not a requirement, you can drop the executable file somewhere on the hard disk and just click it to run. It is also possible to save LastActivityView to a USB flash disk or similar storage unit, in order to run it on any machine effortlessly and without previous installers. An important aspect to take into account is that the Windows registry does not get updated with new entries, and files are not left behind on the HDD after program removal. The interface is based on a standard window with a plain and simple layout, where the list with the recent activity is immediately populated at startup. You can view the action time and date, description, file name, full path and other information. All or just selected items can be copied to the Clipboard or saved to TXT (regular, tab delimited, tabular), CSV, HTML (vertical or horizontal) or XML, for further scrutiny. A search function is provided throughout the list. Plus, you can show time in GMT. LastActivityView has a good response time, is capable of detecting activity prior to its first run, and runs on a very low amount of CPU and RAM, so it does not affect the computer's overall performance. It does not disrupt normal user activity either, since it can be minimized to the taskbar. The tool does not hang, crash or show error messages. In conclusion, LastActivityView provides a simple method for viewing recent activity recorded by your machine, and it should please all types of users, thanks to its overall simplicity.